Posted on Sunday, November 26th, 2006 at 3:00 pm. Subscribe to the comments feed. Both comments and pings are currently closed. Post on your own blog. Extremely cool tip, wish I had a younger brother to beat on with these. Thanks. Those are so not going to work with Wii. We were just discussing nunchucks over lunch the other day. It was decided that the benchmark for claiming to be a nunchuck expert was being able to use them without hitting yourself. 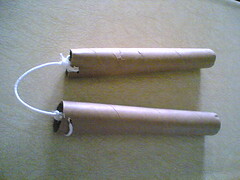 We also wondered why nunchucks were still illegal, yet guns were perfectly ok, at which point I made the comment that you hardly ever hear stories of nunchucks going off when people are cleaning them. 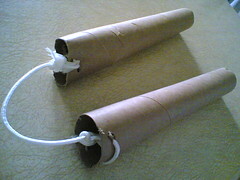 And to think I almost wrote my Wii post right after I posted this… Nunchucks are illegal? So should I try walking around town with these? Do you think I could bring them on an airplane?